Kathryn Leigh Scott, star of the original Dark Shadows series, talks with DJ Cyclonus at Boulevard Tavern's Arkham party in Greenpoint Brooklyn. 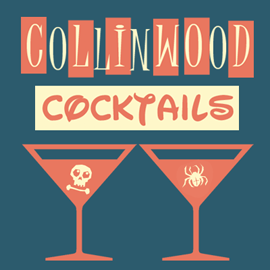 Show your friends and family that you're a member in good standing of The Collinsport Historical Society. The tee shirt is available in a variety of designs, all of them black ... like your heart! 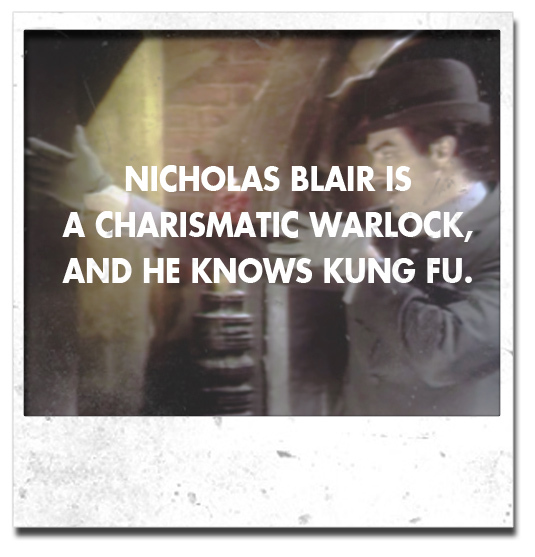 Photo courtesy of Blog of Dark Shadows. 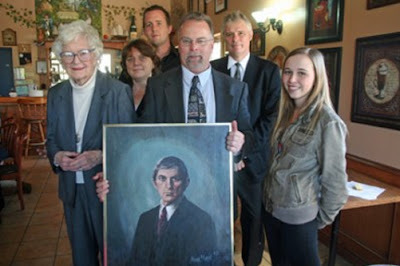 Dark Shadows fans are hoping to reunite the cast of the 1991 Dark Shadows "revival" series in Tarrytown, N.Y., in July. The event takes place 9 a.m. to 5 p.m., Friday July 27, 2012 at Lyndhurst Estate, the filming location of House of Dark Shadows.Organizers have invited the 24 surviving cast members of the 1991 series and are posting updates for the event at its Facebook page. Scheduling conflicts might keep some cast members from attending. Festival organizers have mentioned that Jim Fyfe (Willie Loomis) will be on vacation in July, while Joseph Gordon-Levitt (David Collins) will probably be detained by promotional obligations to the upcoming feature films, The Dark Knight Rises and Looper. Ben Cross recently said on his Facebook page that he was unaware of the reunion. Obligations to his new Cinemax series, Banshee, might override the festival, since he is not expected to arrive for filming in America until mid-July. 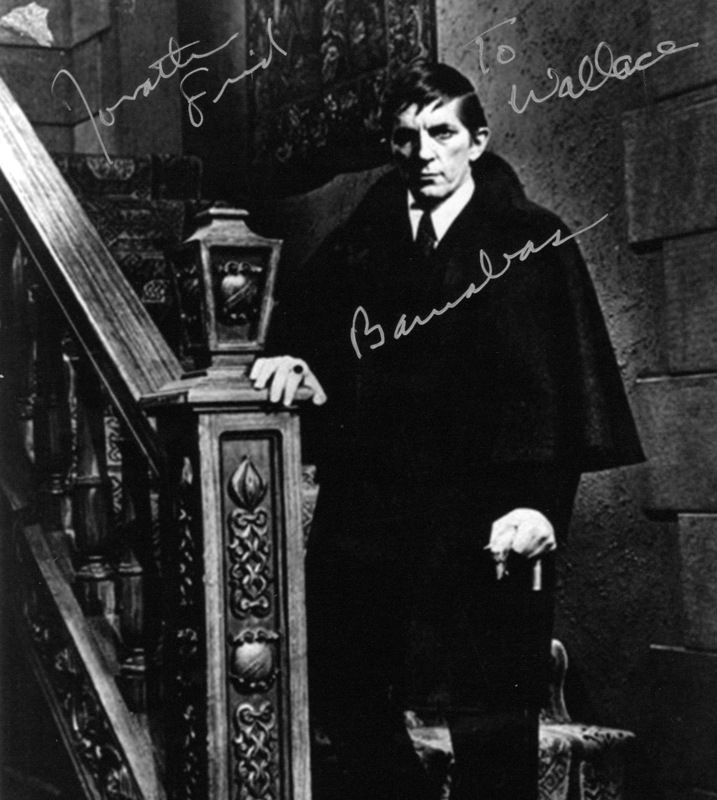 Ben Cross (Barnabas Collins) we are in discussion with management on his attending a cast reunion. Joanna Going (Victoria Winters) definitely will be attending a West Coast Reunion - we are in discussion with management about the East Coast Reunion. Joseph Gordon-Levitt (David Collins) we have contacted management but no response yet. Jim Fyfe (Willie Loomis) as of right now Jim will be away on vacation in July but will try to return to attend this function. Roy Thinnes (Roger Collins) is planning to attend schedule permitting. Barbara Steele (Dr. Julia Hoffman) we are in discussion with her and her management on attending a cast reunion. Barbara Blackburn (Carolyn Stoddard) awaiting her decision. Veronica Lauren (Sarah Collins) contacted management but no reply yet. Julianna McCarthy (Mrs. Johnson) we are in discussion with management on attending a cast reunion. Michael T. Weiss (Joe Haskell) we are in discussion with management on attending a cast reunion. Stefan Gierasch (Joshua Collins) unfortunately suffered a stroke recently and is unable to attend. Michael Cavanaugh (Sheriff Patterson) we are in discussion with management on attending a cast reunion. Ely Pouget (Maggie Evans) she will be attending a West Coast Reunion. Unfortunately she will be away in July and unable to attend. Lysette Anthony (Angelique) we are in discussion with management on her attending a cast reunion. Eddie Jones (Sam Evans) he will be attending a West Coast Reunion and we are awaiting his decision on the East Coast Reunion. Ellen Wheeler (Phyllis Wicke) is planning to attend The East Coast Reunion schedule permitting. Steve Fletcher (Deputy Jonathan Harker) is planning to attend The East Coast Reunion schedule permitting. Rebecca Staab (Daphne Collins) is planning to attend The East Cost Reunion schedule permitting. Adrian Paul (Jeremiah Collins) we are in discussion with management on attending a cast reunion. Apollo Dukakis (Reverend Amos) he will be attending a West Coast Reunion. Rif Hutton (Paramedic #1) we are in discussion with management on attending a cast reunion. George Olden (Gardner) he will be attending a West Coast Reunion. Hope North (Gloria) working on contacting. Michael Buice (Local Tough Guy) working on contacting. "We must tell you that this first event will be a space limited event. We can only sell 300 tickets to the event. It will be on a first come first serve basis. We would feel better if we had more commitments from the stars but we wanted to at least get something out to you to let you know what was going on. If you desire to go ahead and register for this event here is the cost and the process." Visit the event's Facebook page for more details. 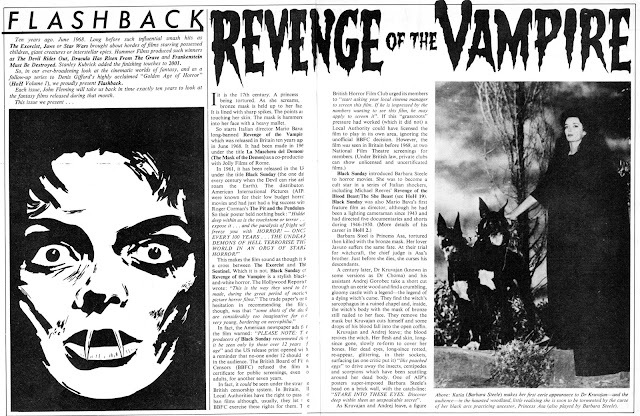 Hammer Halls of Horror incorporated the best of '70s horror magazines. 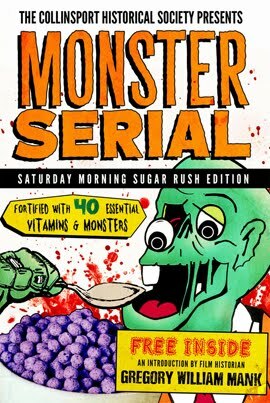 The publication combined the kind of gushing fandom found in Famous Monsters, the legitimate criticism of books and movies found in Castle of Frankenstein, and even some well-drawn comic strips adapting Hammer properties. 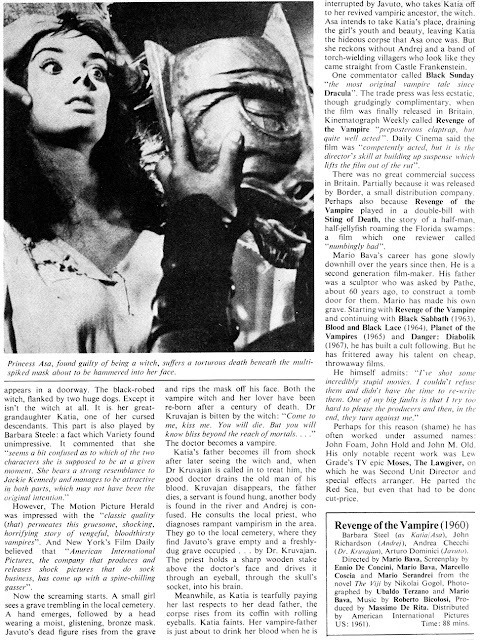 Above are pages from a 1978 issue about Revenge of the Vampire, a Mario Bava film that starred Barbara Steele of the 1991 Dark Shadows revival and Big Finish audio drama, "The Night Whispers." Revenge of the Vampire was an alternate titled for a movie called The Mask of Satan, which is better known to American audiences as Black Sunday. 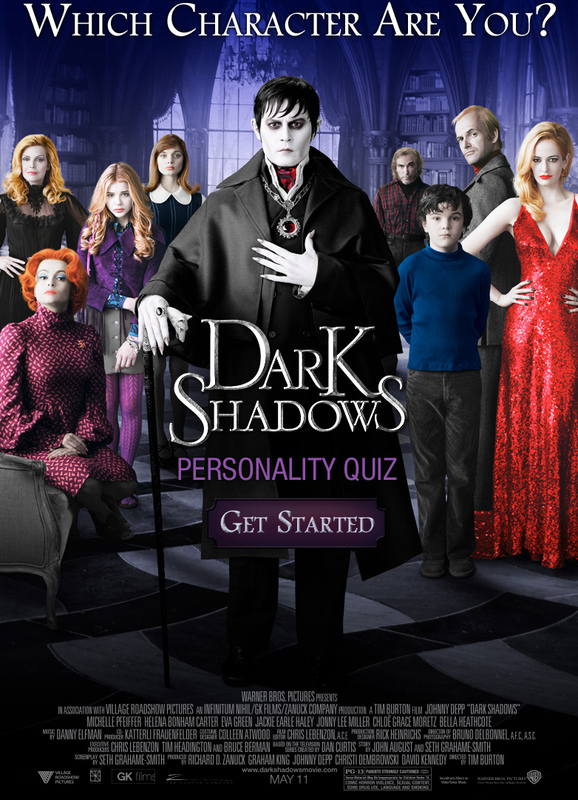 Facebook has a new Dark Shadows app that lets you take an incredibly scientific quiz to determine your personality type. It's a harmless way to waste a few minutes, and I'm curious to see how people respond to the results. I took the quiz and ... well, you should probably think twice before breaking my heart. 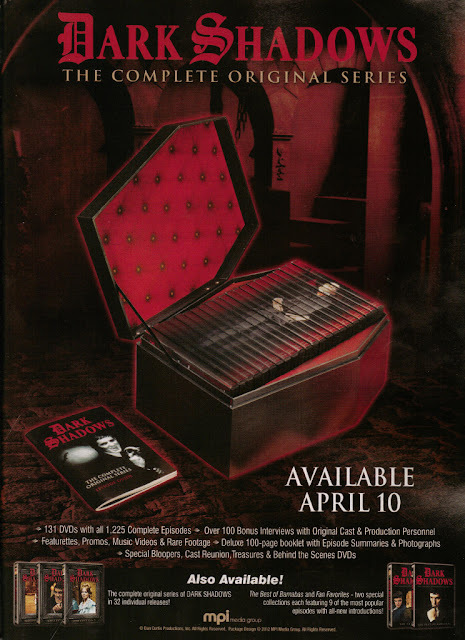 From the outside, watching Dark Shadows must look like a daunting task. The story is massive in scope and character but, as the saying goes, a journey of a thousand miles begins with a single step. There's not really a wrong place to start with Dark Shadows, but some places make better starting points than others. 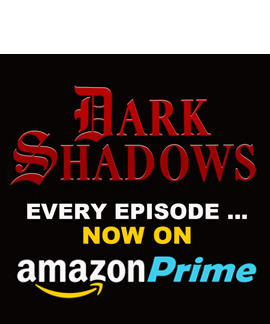 Dark Shadows isn't exactly an unknown quantity in America, but its cumbersome nature (1,200+ episodes) has made it difficult for television stations to package in syndication. Even Netflix has struggled to keep the 26 DVD collections consistently available to subscribers. I've found myself talking about the show a lot in recent months, almost always with people who have never seen it. If you're reading this blog you've likely seen an episode of two, so consider this a primer for newbies. This isn't an attempt to summarize the show's many storylines. Instead, I thought I'd try to explain the appeal of Dark Shadows. If you're trying to convince someone to watch the show, maybe this will help make your case. 1: You don't have to start with the first episode. While it’s best to begin at the beginning of one of the show’s many story arcs, there’s no real need to watch the show from the "pilot" episode (or even from episode 210, when Barnabas Collins joins the cast.) As long as you start at the beginning of any of the show's arcs, you ought to be able to catch up quickly. The 1897 story might even be the best jumping-on point: Barnabas travels back in time and is introduced to new characters and situations, making him as lost as many of the viewers. But the same is probably true for the 1795 story .. as well as The Leviathans, Parallel Time, etc. Dark Shadows goes full-tilt crazy around the time it goes color. If you want to watch the show to see a time-travelling vampire acting as an attorney for a man accused of witchcraft, though, I’d probably not start with episode one. But those of us who have seen the show from the very beginning have a certain fondness for the original cast members ... even those like Mitch Ryan, who didn't stick around for very long. 2. Dark Shadows is both great and terrible. Part of Dark Shadows' appeal is its frequently unavoidable camp nature. Stories change gears without warning, characters sometimes behave in illogical ways, sets fall apart on camera, actors forget lines, and let's not forget about those damn flies ... But the thing to remember is that a good story and camp atmosphere are not mutually exclusive ideals. Dark Shadows can be both great and terrible, and that is its charm. Dark Shadows superfan Will McKinley once told me he thinks the creators of the new movie see the original show as “less evolved,” which it is in many ways. But if you look at Dark Shadows and see nothing but overlit video, creaky special effects and bloopers, you’re only experiencing the show on a level I’d generously describe as “superficial.” The new movie might trump the original show when it comes to production values, but there’s only so much a movie can do in two hours ... and it must get things right immediately. The errors in the television show create a form of intimacy between the cast and audience, like watching an elaborately staged community theater project. I don’t think it’s a coincidence that the show’s fandom is so friendly with the original cast, gathering each year to meet and dine with them as part of the Dark Shadows Festival. Our fandom is a genuine community. When watching Dark Shadows, we’re not rooting for the cast to fail ... but the humor, intentional or otherwise, only makes the show that much more endearing. I’d go say far to say that Dark Shadows can be used as a Soul Detector. If you know someone who sees the show and can only laugh derisively at it, it’s a safe bet they are a horrible human person. 3. Dark Shadows accumulates story. Newbies sometimes finish their first episode of Dark Shadows and wonder what the hell they just watched. The show is a perfect example of non-traditional storytelling and has more in common with a novel than other television shows. 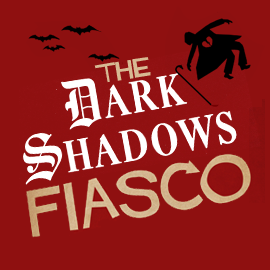 Like baseball, Dark Shadows isn’t about what’s happening during any particular moment. Instead, it accumulates story as it rolls along, even when it sometimes moves at a glacial pace. I’d compare it to THE VENTURE BROS. in some ways because, if you only see a single episode, you’re not experiencing the actual show and are only watching footage. Dark Shadows requires a commitment. If you give it a shot, say 10 or 12 episodes, and still don’t see its appeal, then it’s probably not for you. 4. 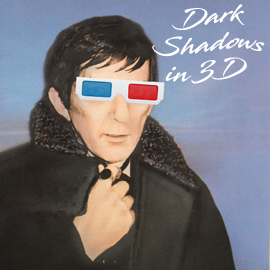 Dark Shadows lives in its own world. Yes, Dark Shadows was cancelled four decades ago, but don't expect a television show full of mini-skirts and Beatle boots. 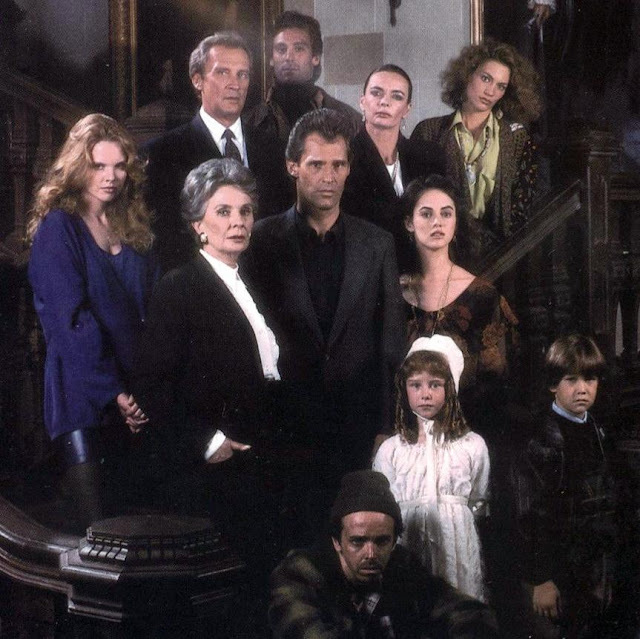 Because Dark Shadows rarely ventured out of the antique architecture of Collinwood (and because it spent so much time in the distant past) there is very little of its era reflected in the show. There are no overt references to Vietnam, the Civil Rights movement, pop music or any of the other things people have come to associate with the '60s. Even though it was set 300 years in the future, Star Trek often feels more dated than Dark Shadows, because it is more a product of its time. For the record, I know NOTHING about poetry and haiku ... feel free to school me. To say the movie has divided fans is an understatement. I live in a part of America that thinks the Civil War still qualifies as "current events," so I know a thing or two about division. I'm trying to remain open minded but, as you might have guessed from the presence of the word "trying" in this sentence, I'm not entirely happy with what I've seen so far. I'm willing to be swayed. But, Dark Shadows '12 could be a grand slam and some people will still choose to hate it. This fight isn't anywhere close being resolved. Before joining the cast of Dark Shadows, actress Clarice Blackburn had an extensive resume of theater credits. 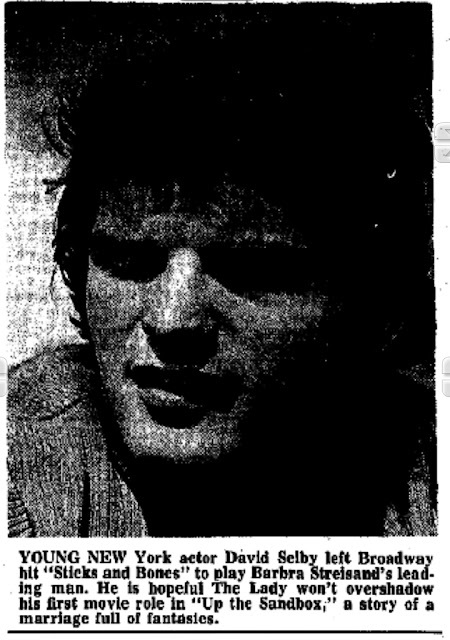 Blackburn, who was given the thankless job of playing the Collinwood housekeeper (among other characters) won an Obie award the year Dark Shadows launched. Also recognized that year were Dustin Hoffman, Frank Langella and Sam Shepard, so she was in pretty good company. 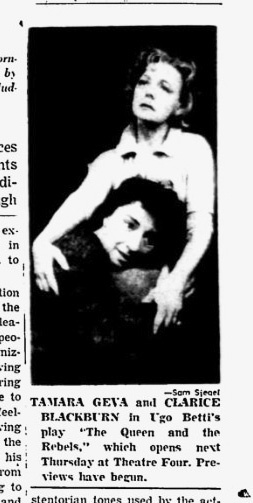 Above is a notice from the Feb. 18, 1965, edition of The Village Voice about the play The Queen and the Rebels, one of two plays she appeared in that year. 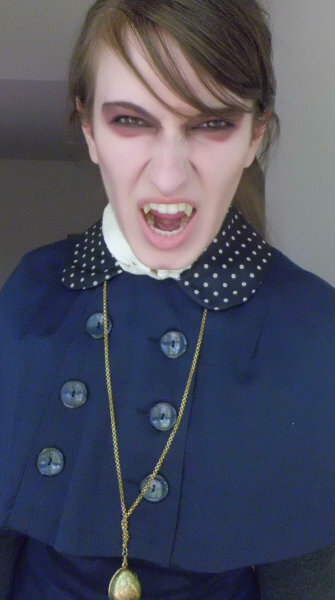 LadyduLac has created an interesting Lady Barnabas costume, and has shared some photos of it via her Tumblr and DeviantArt accounts. I'm a big fan of cosplay but have rarely ventured too far into it, save for that time I dressed as Wolverine as part of a Warrior Dash even at Jellystone Park. Tip: Don't wear jeans for any activity that requires you to crawl through mud before jumping over a wall of fire. In the meantime, visit LadyduLac and let her know what you think about her work. I've posted only one pic above; more are available at her personal sites. 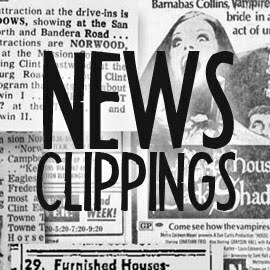 Speaking of Tarrytown, N.Y.,here's a May 24, 1970, clipping from The St. Joseph News-Press about the filming of House of Dark Shadows. "I'm not typed. I'm the least typed on the show," Frid says in the story. "I've played compassion, violence, Vampire, self pity, God, the devil." 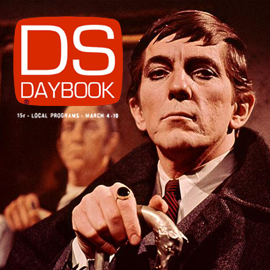 Will McKinley and The Cinementals have news about the annual Dark Shadows Festival's plans to honor the late Jonathan Frid this summer. Set for Tarrytown, N.Y., on July 28, the festival's memorial will feature a collection of Frid's favorite Dark Shadows clips hosted by nephew Donald Frid, tent screenings of the feature films House of Dark Shadows and Night of Dark Shadows, and a recent video interview with the actor. 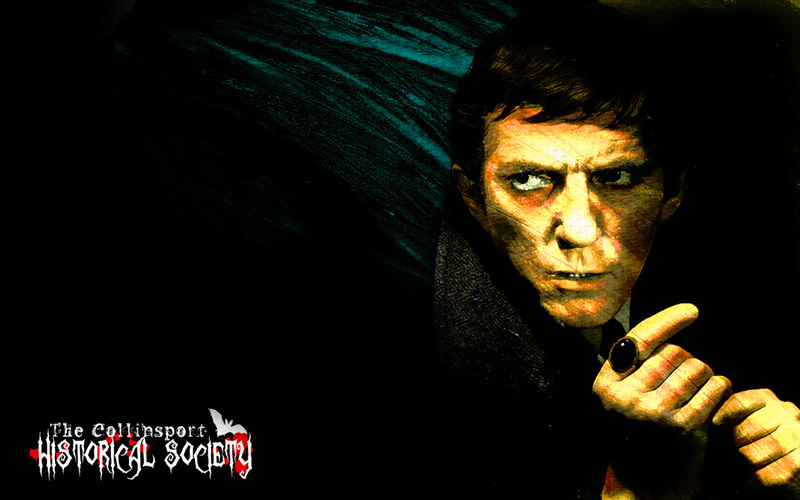 Head on over to The Cinementals to get the complete details the Jonathan Frid tribute planned for this year's festival. The Cinementals is a welcome breath of fresh air for movie fandom, and one of the few authoritative, writing-based online movie publications that isn't obsessed with whether or not George Lucas is going to make another Star Wars film. Sticks and Bones was a dark comedy that contrasted the Americana of "Ozzie and Harriet" with the everyday ugliness of life that rarely surfaced on classic television. A review of the play from the Nov. 11, 1971, issue of The Village Voice is above, while a photo from the May 6, 1972, issue of the Indiana Evening Gazette explains why Selby decided to leave the successful production. 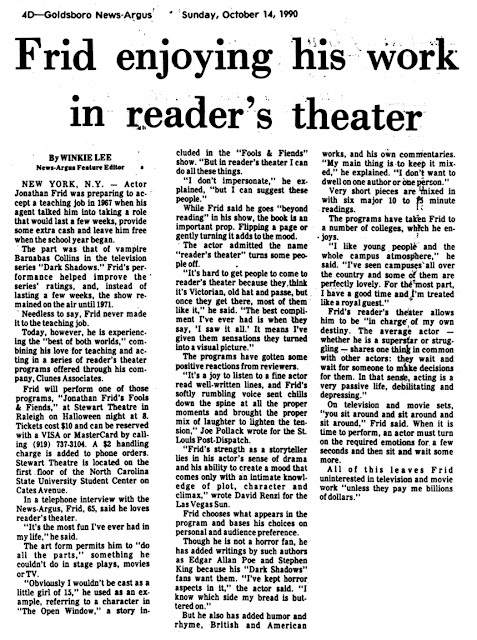 "It's hard to get people to come to reader's theater because they think it's Victorian, old hat and passe, but once they get here, most of them like it," Jonathan Frid said of his 1990 "Fools & Fiends" tour. "The best compliment I've ever had is when they say 'I saw it all.' It means I've given them sensations they turned into visual pictures." 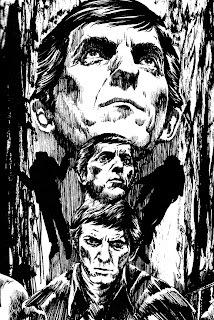 My e-mail has been flooded during the last few days as the death of Jonathan Frid has spread around the world. It seemed like it took a few days for the mainstream media to determine if his passing was newsworthy and, when they did, news spread like wildfire. A few days ago I highlighted some of my favorite comments about the actor, mostly from friends and coworkers, but thought I'd share some links to some other sites, as well. 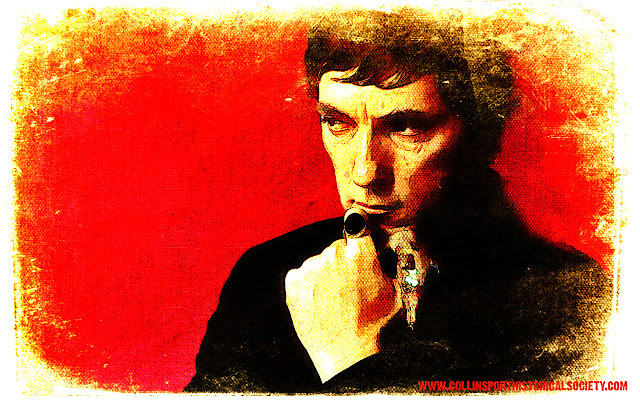 Special thanks to the members of Facebook's Jonathan Frid Discussion Group for sharing some of these links. Audio dramas pose very specific kinds of storytelling challenges. I’ve tended to think of these challenges in terms of writing, because the script is the first line of defense (and possibly offense) when it comes to solving storytelling issues. As with music, audio dramas have to convey their intention using only sound, and I imagine a script for a Big Finish story not only includes dialogue, but sound and music cues, as well. A Big Finish production probably looks orchestral on paper. While listening to the latest Big Finish release, Dress Mein Dark Dreams, I realized that the medium also presents a challenge for the actors, as well. Tim Curry was reportedly crestfallen when director Ridley Scott asked him to wear contact lenses in the movie Legend, because his eyes were the only parts of the actor’s body not covered my make-up appliances. Curry was worried that he’d lost his last connection to the audience, and that the make-up turned him into a glorified puppeteer whose job was to essentially manipulate a costume offscreen. 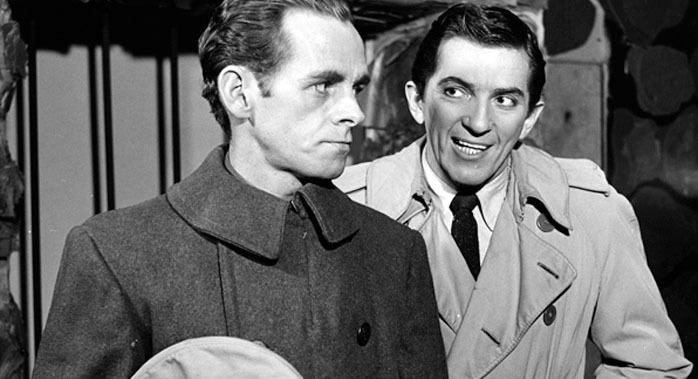 The actors in audio dramas have no visual connection with their audience, not even a proxy connection like Curry’s heavy make-up, forcing them to dig a little deeper into their bag of tricks. 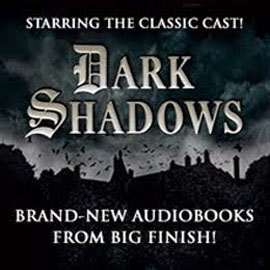 When I’ve told people about the Dark Shadows audio dramas, I’ve taken on a very apologetic tone and have asked people to forgive their seemingly anachronistic qualities. After listening to Dress Me in Dark Dreams, though, I think it’s time to acknowledge how goddamn difficult it is to tell an effective story using only dialogue and sound effects. There’s a very specific skill set involved with creating these stories, and they are skills that would confound the Michael Bays of the world. Creating an audio drama has its challenges, but so does writing about them. 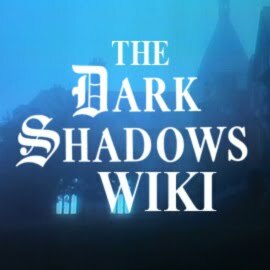 The Dark Shadows series are mysteries, which makes discussing their twists and turns incredibly difficult without spoiling the experience for new listeners. If you’re trying to avoid spoilers, it’s safe to proceed further. 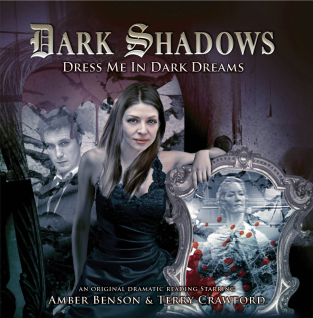 Dress Me in Dark Dreams is set roughly 25 years before the 1897 television story and stars Amber Benson as a young Judith Trask, a role played in the original series by Joan Bennett. Resentful of the freedoms and attentions granted to her brothers, Judith spends much of her days with her grandmother, Edith, who does her best to discourage Judith’s rebellious spirit. Judith is cast very much from the Disney Princess mold in this story, and her arc plays out a little like a gothic version of The Little Mermaid. 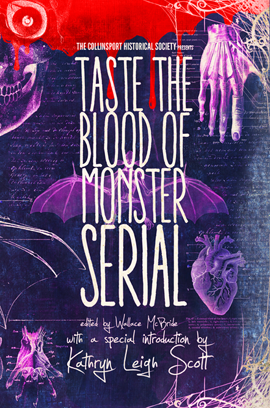 Judith is slowly seduced by specter in a rarely visited area of Collinwood, a man who is probably not the figment of her imagination that she initially believes, and it becomes steadily apparent that Edith knows more about the situation than she wants to reveal. Appearing with Benson is Terry Crawford, reprising her role as Edith Collins. I’ve seen the entire run of the original Dark Shadows twice, and I’m embarrassed to admit that I never realized that Edith Collins of 1840 and grandmother Edith in 1897 are the same person. It’s possible that continuity errors in the original show contributed to my confusion but, either way, Crawford is a welcome presence here. Dress Me in Dark Dreams isn’t the fastest paced Dark Shadows story produced by Big Finish, and it suffers from some of the same problems of formula shared by previous installments (the antagonists in a lot of these stories tend to be phantom voices) but the writing has a lot of vivid, effective imagery. There's a sexuality in this story rarely seen in Dark Shadows and, though it is mostly symbolic, it underlines the tale's theme of innocence lost. While many of the story’s conflicts could have been quickly resolved in Edith has just explained the situation to Judith, the episode does a fine job of connecting two chapters in the Dark Shadows mythos while also embellishing characters that were originally a little underwritten. I was initially concerned about Benson’s casting when it was announced, but I was also interested to see if Benson would affect an overt impression of Bennett in the story. She does not, which is probably the best possible decision. Considering their age difference, it makes more sense for Judith to be less formal and more impulsive, and she is not yet the repressive spinster we see in the original series. What’s interesting is that this story actually transforms her 1897 arc into a tragedy because, as a young woman, she was resentful and terrified of the loneliness that Collinwood bred. It also goes a long way toward explaining the cruel, violent manner in which she responds to her later heartbreak. 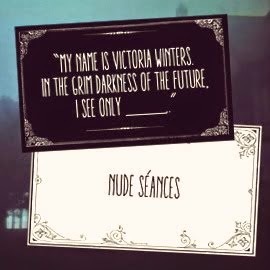 Dress Me in Dark Dreams isn’t my favorite of the Big Finish audio dramas (The Skin Walkers is still reigning champion) but anyone who loves the 1897 story arc will probably enjoy what Dress Me in Dark Dreams brings to the table. I say check it out. 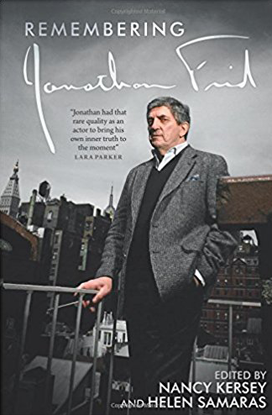 Jonathan Frid quite liked Shakespeare, even if his relationship with The Bard was usually overstated by the Dan Curtis Productions marketing department. Oddly, Mitchell Ryan performed in more of Shakespeare's plays than Frid, whose career featured a great many contemporary comedies and thrillers. 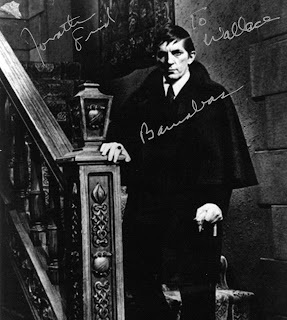 But Dan Curtis rightfully believed that exaggerating Frid's experience with classic theater brought a certain gravitas to the role of Barnabas Collins. Introducing a vampire into an on-going soap opera in 1967 was going to be a tough sell. But a vampire played by a classically trained actor? Those press notices practically wrote themselves. 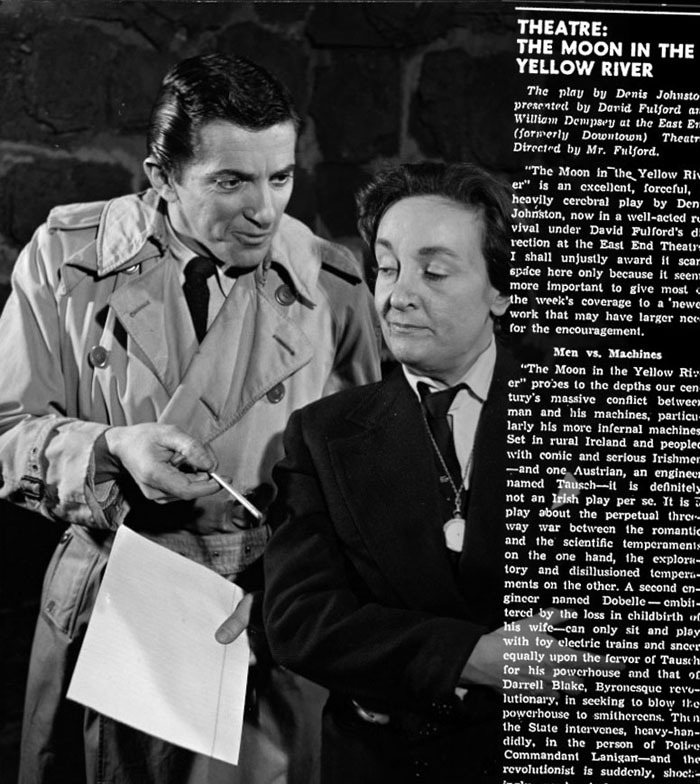 Below is a review of the 1961 production of THE MOON IN THE YELLOW RIVER, a play featuring James Coco and Frid. The play had 48 performances in the East End Theater, with Frid getting a favorable nod from The Village Voice, which you can read in its entirety below. The review was published Feb. 16, 1961. The play by Denis Johnston, presented by David Fulford and William Dempsey at the East End (formerly Downtown) Theatre. Directed by Mr. Fulford. 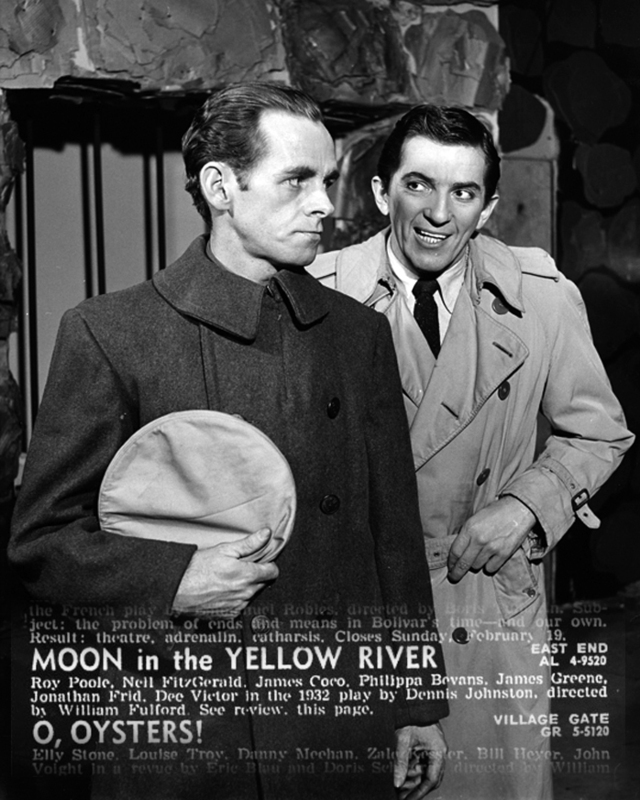 "The Moon in the Yellow River" is an excellent, forceful, if heavily cerebral play by Denis Johnston, now in a well-acted revival under David Fulford 's direction at the East End Theatre. I shall unjustly award it scant space here only because it seems more important to give most of the week's coverage to a newer work that may have larger need for the encouragement. "The Moon in the Yellow River” probes to the depths our century’s massive conflict between man and his machines, particularly his more infernal machines. Set in rural Ireland and peopled with comic and serious Irishmen — and one Austrian, an engineer named Tausch — it is definitely not an Irish play per se. It is a play about the perpetual three-way war between the romantic and the scientific temperaments on the one hand, the exploratory and disillusioned temperaments on the other. A second engineer named Dobelle — embittered by the loss in childbirth his wife—can only sit and play with toy electric trains and sneer equally upon the fervor of Tausch for his powerhouse and that of Darrell Blake, Byronesque revolutionary, in seeking to blow the powerhouse to smithereens. Then the State intervenes, heavy-handedly, in the person of Commandant Lanigan — and the revolutionist is suddenly, shockingly, removed from the equation. "Oh Got," cries Tausch after the event, "vy must Mr. Blake be against me and Commandant Lanigan on my side.” His host Dobelle merely spread distributionist sarcasm on the wounds and ashes and sets his little electric train buzzing on its eternal circlings. Then fate intervenes—once again with a shock, but this time with the shock of ironic absurdity. The rumblings of two old rummies — side characters not heretofore taken seriously — results in the powerhouse being blown to smithereens anyway. Even Dobelle is jolted out of his cynicism and back to the first tentative steps of caring for people and life. Amid all the jokes and shambles there is, as with O’Casey, the beauty and warmth of human values. Nobody wins. But at least Dobelle can begin to feel. Roy Poole docs his best, quietest work in several years as Dobelle, the intellectual of bad will; James Coco is both ardent and persuasive as Tausch, the dedicated intellectual of great good will; James Greene is properly chill as Lanigan the gunman turned Free Slate commandant; Jonathan Frid is right fiery as the gallant but stupid would-be saboteur; all others in the company are of a par. A solidly stimulating evening. — J.T. 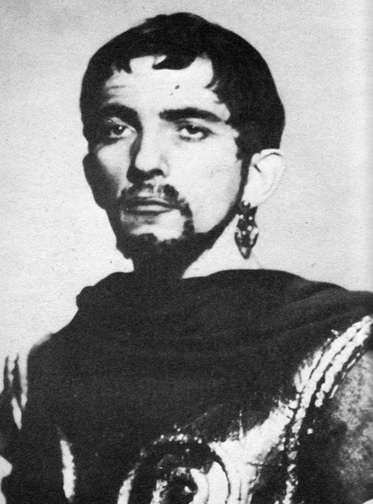 A young Jonathan Frid appeared in a production of Shakespeare's Coriolanus. Jonathan Frid was a fan of Shakespeare, which is no secret. In early 1964, he appeared in The White Rose and the Red, an off-Broadway play that also featured David Ford (Sam Evans of Dark Shadows.) It had about 30 performances on Stage 73 and appears to have been a Shakespearean pastiche. Ford is mentioned in The Village Voice review below; unfortunately, Frid is not. I didn’t bother with the usual obituary yesterday. 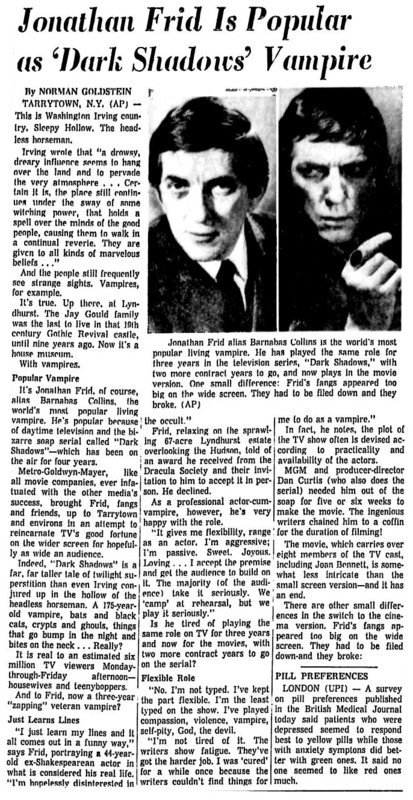 The notion of summarizing Jonathan Frid’s stage and screen roles, his importance to Dark Shadows fans and his indelible (if unintentional) contribution to horror tropes seemed a little beside the point here. I know my audience and guessed, with the possible exception of those who find this place by Googling the words “johnny depp as barnabus,” that you know all of that stuff already. It was my plan to bypass the usual fan eulogy and to stay the course with my scheduled content, celebrating Frid’s life and work by merely discussing it. Celebrating it. Remembering it. I feel like that is the healthiest way to deal with loss. And many of you have expressed yourselves much better than I could. But Frid’s death isn’t my loss. Not really. As much as I admired Jonathan Frid, I didn’t know him on any real level. I’m still taken aback when I see video interviews of him because his natural body language and voice are nothing like Barnabas Collins. 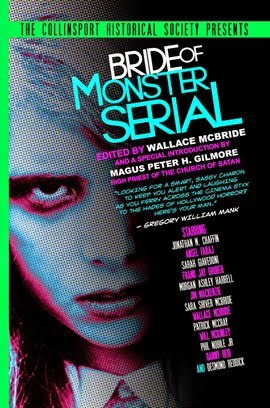 Despite what some would have you believe, the vampire was not a collection of personality tics that accidentally gelled into a character. It was a fully realized performance, and that only put more distance between Frid and his audience. Most of us wouldn’t get on Facebook and participate in dozens of threads to talk about the death of a friend or loved one. The loss is too material for us to share with people who are virtually strangers. 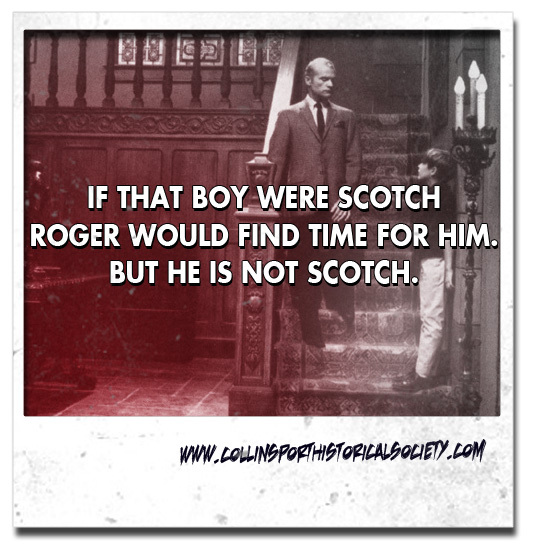 But we do just that when a celebrity dies, even one who has been as personable and reclusive as Jonathan Frid. His death is not our loss. But then again, it is, only not in a way that’s easily identifiable. It’s a communal loss, which is why we’re so prone to discuss it with strangers. Because, all other differences aside, we loved Jonathan Frid in our own way. No matter what else sets us apart, we’ve got that much in common. Last night, as I watched a handful of Dark Shadows episodes with the lights out and drank a beer (it was a honey brown lager, if you must know,) it occurred to me how very fortunate we are as fans. 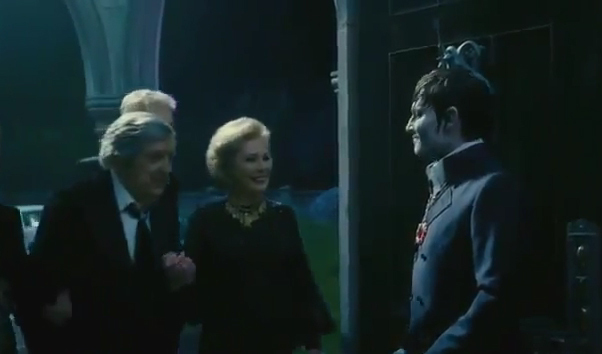 The cast of Dark Shadows has been willing to interact with us on a level unheard of in fandom. If you doubt me, try to give William Shatner a compliment and see how far you get. I’ve sensed no anger or resentment from Kathryn Leigh Scott, David Selby, Lara Parker or Jim Pierson since the announcement of Frid’s death. Not only have they been respectful of our feelings, many of the public statements they’ve released have been entirely for our benefit. So I’d like to tell them “thank you” for being so kind. Your loss has been much more tangible than ours, yet you still took the time join in our celebration. 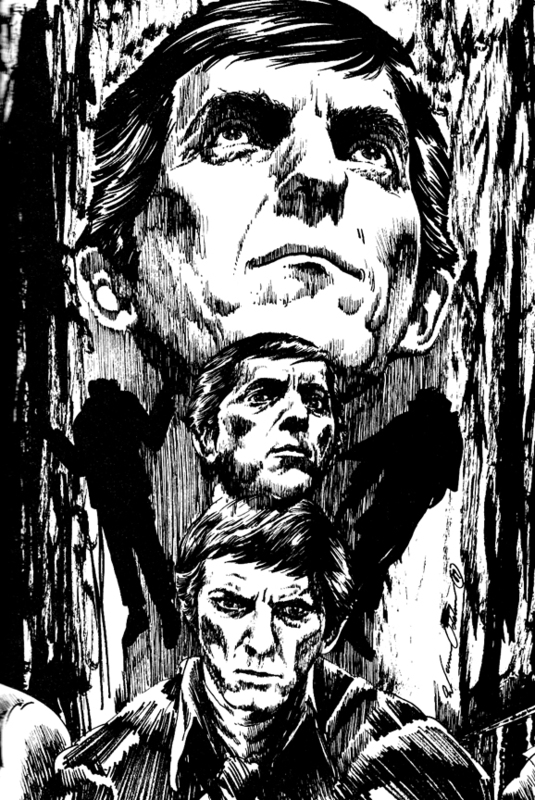 And thank you, Jonathan Frid, for the gifts you’ve given us.